I’m also occasionally peering at Andy Ihnatko’s liveblog. 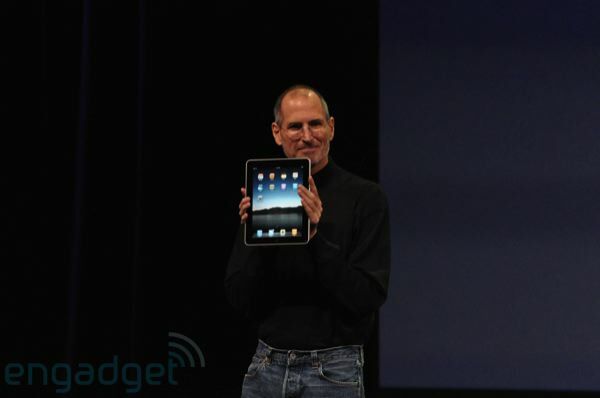 Engadget is skeptical but impressed with allegedly leaked photos: “Is this the Apple tablet?” Update: Yes, it is. Derek Powazek states his wish—and it’s about content, not so much about hardware—and I totally agree: “What I Hope Apple Unleashes Tomorrow” This excites me more than the device itself. Update: I dunno. 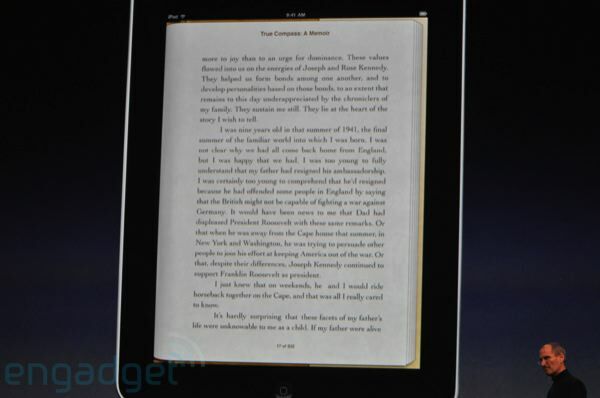 Other than noting that they use the ePub format, no word on the publishing process. 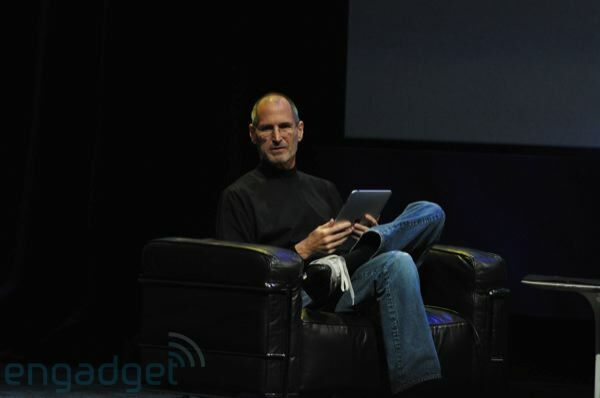 It’s the iPad. Looks like an iPod touch scaled up to about letter size, with interface enhancements to make better use of the space. Steve’s just sitting in a comfortable living-room chair, surfing around on it. Nice. Photos from Engadget. Definitely go there and see all the pictures. 1/2 inch thick, 1.5 pounds, 9.7 inch LCD display, and powered by Apple’s own processor. Interesting. 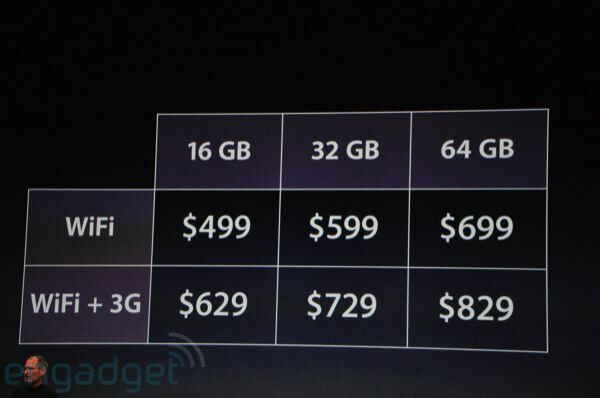 16, 32, or 64GB flash storage. Bluetooth and WiFi. Accelerometer. Compass. Speaker and microphone. 10 hours of battery life (and a month standby). Can run iPhone apps, either at original size or pixel-doubled to fill the screen. Apps can be rewritten to use the full screen resolution. 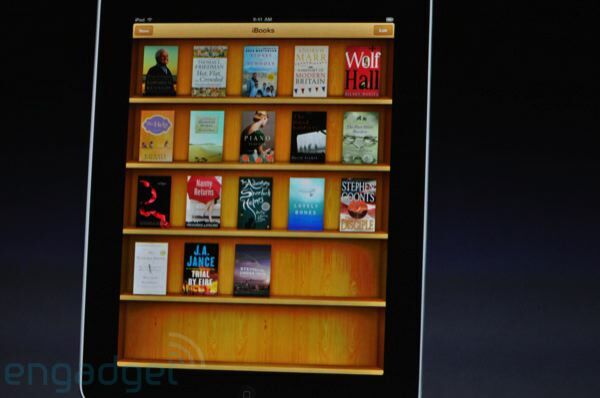 There’s a bookstore, iBooks. The interface looks an awful lot like Classics for the iPhone. And iWork for the iPad. Available: a keyboard dock. Wait…a keyboard dock? Not Bluetooth? Wha? Wow, it looks like every one of my “ought”s (except for storage) got left out. Update: MacInTouch reports that the iPad does support Bluetooth keyboards. Very good. SD card reader available as an accessory. Okay, that’s good. All right, back to work for now.